In 1966, on the wave of the success of "The Saint", Roger Moore helped in assembling an adventure book (presumably with teenage readers in mind, but not only) featuring a couple of fiction stories and some articles about a real-life heroes, like Jacques Costeau, Tenzing or General Charles Gordon (featured in Basil Dearden's 1966 movie "Khartoum", from which stills are also used in the book). 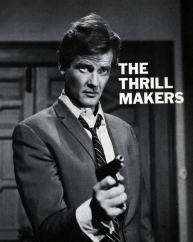 Moore himself wrote an introduction and an article entitled "The Thrill Makers" about the stuntmen working on movies and television. He has also contributed a commentary to the instructional comic "Self Defence and the Saint". The book, presented in a nice artwork hardcover, was published by Panther Books in association with Souvenir Press. A few rarely seen pictures of Roger Moore from and off the screen were added in the book. The full title of the publication was: "The Roger Moore Adventure Book. Action, Excitement and True Life Adventure Presented by Television's 'Saint'." Below you can read transcriptions of the introduction and Roger Moore's advices on self defence and judo. I was quite fearless in the way that I headed straight into that blazing furnace that had been a garage to rescue someone in terrible danger. And then I remembered. I wasn't really Simon Templar, the hero with stainless-steel nerves. I was Roger Moore, actor. And Roger said to Simon: "Hello, matey, somebody's going to get burned here if they don't get out in a hurry." So I did what the scene called for me to do, and then got out - fast! I have been playing adventurous characters for years - in Ivanhoe, followed by The Alaskans, and then Maverick. I wasn't too happy riding around in all that armour in Ivanhoe - I thought I looked like a medieval fireman. Then I went to Hollywood to make my first American TV series, The Alaskans, and the very first day in the studio, they shoved me on to a giant set with a dog team they had brought from somewhere. "Mush! Please musch!" I kept pleadining with the dogs, but they took no notice at all. They were much too interested in eating the artificial snow on the set. When I finally got them moving, the lead dog promptly stopped at the first fake pine tree, and all the other dogs followed suit. Then James Garner left the Maverick series at our studio, and I had to step into his part in that most Western of Westerns, although I was so obviously English. And then, along came The Saint. I first read the Leslie Charteris Saint books when I was a schoolboy in London, and I wanted to play The Saint a long time before I was offered the part. I knew this character was for me. I can only look like me and take on the part of the character I play. The Saint is a kind of superman - out of the ordinary - made believable by the adventures he gets into, and the manner in which he deals with situations. The Saint and I have several things in common. We both like to take chances. We both like good food, wine, and fine clothes. We also like fast cars. We also both like excitement, and adventure, which brings me around to this book. I love hearing about real-life heroes because, let's face it, whoever first said that truth is stranger than fiction, couldn't have been more right. So I have gathered stories for you from the worlds of fact, and fiction. Both are exciting. Heroes come in all shapes and sizes - from Tenzing of Everest, to Oceanaut Jacques-Yves Costeau. And adventure can be found in all kinds of places - in the jungles of Africa, or on a night train to Washington. 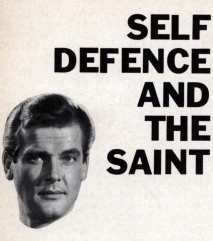 Self Defence and the Saint by ROGER MOORE: It's a good thing to know how to take good care of yourself - on, and off, the screen. The Saint has to pull a few judo, and other, strokes from time to time to get himself out of scrapes - and sometimes into them! But the art of self defence is a very useful thing to know. The Saint usually fights the Queensberry rules, with a little judo thrown in, and I often find I am unable to leave The Saint behind me when I leave the studios. Trouble isn't hard to find. Play a tough part, get identified with it, and there are always idiots ready to take you seriously. If this happens, I don't allow it to develop into a brawl. Fights are a bit like chess - you take the initiative from the start, and work out the moves. So when somebody tries to prove that The Saint is a pushover when he is off duty, I play it cool. And if the chess bit doesn't work, and the man still wants to throw a punch, I move on. Or at least, if he is bigger than me. But I also know how to take care of myself - if I really have to. I have learnt. Don't run away with the idea that The Saint on television is an easy life. It can be rough, and it is always hard work, so I always keep myself up to scratch with my karate, boxing, fencing, and judo. Which brings me to the point that some judo know-how is a very handy thing for anyone to learn. With judo, size doesn't matter. It is knowing the right place to grab that counts. You are just as strong as anyone else in the places that matter. It is balance that counts. You have to learn to distribute your weight on both legs. Never, never get cought with your feet together when you have to defend yourself. Legs apart, always, and they will have a hard time knocking you over. There are so many fabulous judo tricks. For some strategic attacks on the nerve centres you can't beat judo. Someone tries to throttle you. You simply pull his little finger a certain way, or his thumb, and you will have him off you in no time. It really works. You can paralyse anyone who creeps up behind you. But remember, I am not talking about playing games. Judo is serious self defence that you should learn, and use, seriously. Nosher Powell, the heavyweight boxer who taught me to spar, once got into an argument with my judo instructor. The judo man said his skill gave him the edge on a boxer. Hosher just grinned. Waved a massive right fist in the air and reminded him: "You've got to get past that, chum." The discussion got a bit warmer, both men convinced that theirs was the best system. Finally, the judo expert said: "You'd be nearly helpless if we each fought according to his own rules. Supposing I got down on the floor and attacked you from there?" Nosher thought about it for an instant. Then a big grin spread over his face. "Simple - I'd blooming well count you out!" he chuckled. But, whatever the respective merits of boxing versus judo, there is no doubt that judo is the handiest art of self defence because size and strength are not the important factors. Knowing what to do, and doing it right, is what matters, and here, simply and clearly illustrated, are eight self defence lessons for you.